December, the cold winter month is a popular time for parties and celebrations. While some are filled with solemn tradition, others focus on fun and frolic. All pose opportunities for an interesting view of different cultures, history, and religion. This is a Christian holiday that's grown in popularity and celebrated by many non-Christians. Christmas is one of the paid holidays by employers in the U.S. Non-religious people celebrate this holiday with family, giving gifts, volunteering to help with charity events, or donate to good causes. Religious people celebrate this Christian holiday by going to church, giving gifts, and sharing the day with their families. In some parts of Europe, “star singers” go caroling—singing special Christmas songs—as they walk behind a huge star on a pole. The Christmas festivities in Ireland tend to be more religious in nature rather than being about gifts. Christmas celebrations last from Christmas Eve until January 6 (Epiphany). On December 26, known as St. Stephen’s Day, an Irish tradition that is known as the Wren Boys Procession takes place. The Christmas Eve festivities in Ukraine are known as Sviata Vechera, which means “Holy Supper.” The celebration begins when the first evening star is sighted in the night sky. In farming communities, the household head brings in a sheaf of wheat, which symbolizes the wheat crops of Ukraine. It is called “didukh,” which translates to “grandfather spirit.” In homes within the city, a few stalks of wheat may be used to decorate the table. For eight days each November or December, Jews light a special candleholder called a menorah. They do it to remember an ancient miracle in which one day’s worth of oil burned for eight days in the temple. During Hanukkah, many Jews also eat special potato pancakes called latkes, sing songs, and spin a top called a dreidel to win chocolate coins, nuts, or raisins. A popular December holiday in many European countries, St. Nicholas Day, celebrates St. Nicholas of Myra, the man whose life inspired the tradition of Santa Claus and Father Christmas. He gave all of his money to the needy and was known for his compassion for children and all those in need. The holiday honors the man on the anniversary of his death, December 6, 343 A.D. Many celebrate with parades, feasts, gift giving, and festivals. Also known as the Virgin of Guadalupe, is a Catholic title of the Blessed Virgin Mary associated with a Marian apparition and a venerated image enshrined within the Minor Basilica of Our Lady of Guadalupe in Mexico City. Kwanzaa, which means “First Fruits,” is based on ancient African harvest festivals and celebrates ideas such as family life and unity. During this spiritual holiday, celebrated from December 26 to January 1, millions of African Americans dress in special clothes, decorate their homes with fruits and vegetables, and light a candle holder called a kinara. At the end of the Twelve Days of Christmas comes a day called the Epiphany, or Three Kings Day. This holiday is celebrated as the day the three wise men first saw baby Jesus and brought him gifts. On this day in Spain, many children get their Christmas presents. In Puerto Rico, before children go to sleep on January 5, they leave a box with hay under their beds so the kings will leave good presents. In France, a delicious King cake is baked. Bakers will hide a coin, jewel, or little toy inside. The Winter Solstice occurs around December 21. It is the shortest day of the year. People all over the world participate in festivals and celebrations. Long ago, people celebrated by lighting bonfires and candles to coax back the sun. In the Gregorian calendar, New Year's Eve, the last day of the year, is on 31 December which is the seventh day of Christmastide. In many countries, New Year's Eve is celebrated at evening social gatherings, where many people dance, eat, drink alcoholic beverages, and watch or light fireworks to mark the new year. In Ecuador, families dress a straw man in old clothes on December 31. The straw man represents the old year. The family members make a will for the straw man that lists all of their faults. At midnight, they burn the straw man, in hopes that their faults will disappear with him. New Year’s Eve, is considered the second-most important day in Japanese tradition as it is the final day of the old year and the eve of New Year’s Day, the most important day of the year. Families gather on Ōmisoka for one last time in the old year to have a bowl of toshikoshi-soba or toshikoshi-udon, a tradition based on eating the long noodles to cross over from one year to the next. Children dress in new clothes to celebrate and people carry lanterns and join in a huge parade led by a silk dragon, the Chinese symbol of strength. According to legend, the dragon hibernates most of the year, so people throw firecrackers to keep the dragon awake. Eid Al-Fitr is celebrated at the end of Ramadan (a month of fasting during daylight hours), and Muslims usually give zakat (charity) on the occasion which begins after the new moon sighting for the beginning of the month of Shawal. There's so much to celebrate in December! Erika M. Szabo​ shares the holidays that fill the last days of the old year and the first few days of the new year on #OurAuthorGang! What a wonderful tribute to the many holidays that fill the last part of November, December and the first days of January! Thank you!! 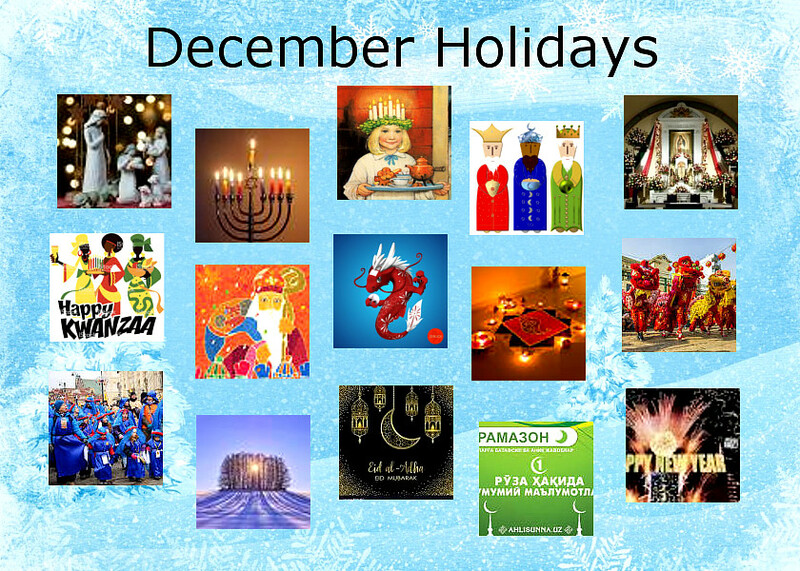 #OurAuthorGang presents a tribute to some of the December Holidays celebrated around the world.